Don’t get confused by the title. I’m not one more 20something Christian ditching the importance of personal growth in the name of authenticity or liberties. I’m referring to the fact that there’s a definitive aspect of sanctification that takes place at a person’s conversion. And unfortunately, in our concern to keep Christians focused on growing, evangelical theology (or to the degree there is such a thing) has so focused on progressive sanctification that we’ve nearly lost the doctrine of definitive sanctification. Don’t get me wrong, progressive sanctification—which means our ongoing growth in Christ through this lifetime—is essential and needs to be taught. But, my contention is that progressive sanctification detached from its definitive aspect takes the firm foundation of God’s action on our behalf out of the equation. In my opinion, one of the reasons why in our fight against sin we feel like it’s a battle too big to be won is because we don’t realize what actually happens to us and for us at salvation. We’re not only justified when we believe in Jesus (and we are justified at that moment) but we’re also set apart as holy. Definitive sanctification refers to the initial act of sanctification that occurs at the moment of salvation when we’re united to Christ and thereby made holy and freed from sin’s power. The New Testament emphasizes the work of Christ for us and how he accomplishes what we need for holiness. It teaches that sin has already been conquered for us so there’s no reason to let it rule us. We can obey the command to be holy because we have been made holy. We can put to death the deeds of the body because we participated with Christ in his death. We can progress in sanctification because of the definitive sanctification that took place. In 1 Corinthians 6 Paul reminds the church that they’re no longer characterized by past sins because of what happened at conversion. Well what is it that happened? “And such were some of you. But you were washed, you were sanctified, you were justified in the name of the Lord Jesus Christ and by the Spirit of our God” (I Cor. 6:11; see also Heb. 10:10). Paul states that we were sanctified, pointing to the fact that at the moment of salvation God sets us apart as his own possession and purifies us from our uncleanness. Romans 6 highlights our union with Christ, which entails us participating in his death and resurrection. We are participants not in the sense that we helped complete the task but that we receive the full benefits because in a very real sense when Christ died we are reckoned as having died in him and when he rose we also rose with him. We’ve only looked at a few instances but they point to the reality that sanctification conveys in Christ we are freed from sin’s power, cleansed from its defilements, set apart as God’s treasured possession, and made holy. There is no sin too great to be overcome and Christ has won the victory for us over sin. The hope resides in our real identity in Christ which we simply strive to live out by the power of the Holy Spirit. Sanctification is not about becoming something new or doing something new but living in light of what Christ has done for you. When sin seems like too great a foe or you’re struggling to walk in holiness remember your true identity in Christ. He has already equipped you by setting you free from the pollution and power of sin. Chapter 1 of The Bruised Reed was short and sweet. It stated that commission or calling Jesus received (Servant-Messiah) and the manner in which he carried that calling out (i.e., so as not to break a bruised reed). It also briefly outlined two foundational points: (1) we are reeds (and not oaks), and (2) bruising has many good intended effects. Chapter 2 is titled “Christ Will Not Break the Bruised Reed.” Whole paragraphs deserve quoting so my challenge here is what to leave out. Some have complained about the weightiness of Puritan writings. If your goal is to simply finish books quickly then yeah, you should probably stick with 21st century writings. But, one of the things I appreciate about Puritan Paperbacks (or Puritans in general) is that every page contains weighty ideas that stretch the mind and stir the heart. You can pick up the book and read one or two pages and then put it down and just mull over what you’ve just read. My advice would be to read Puritan Paperbacks like this, not like a story where you read long narratives at a time and not like most contemporary Christian literature where you need to dig through whole chapters to find a gem. 1) The “comfortable relationships” Jesus has taken upon himself: husband, shepherd, brother. 2) The gentle names used to describe himself: lamb, hen, dove, savior. 3) The gracious way he executes his offices: inviting the poor in spirit, asking us to cast our cares on him, interceding for us with tears, and a meek king. This is not to say that Jesus is only meek and mild, since he most assuredly possesses incomparable strength and dignity, but it is to say “he will not show his strength against those who prostrate themselves before him” (9). In the next section he provides three points (one paragraph each) of what we should learn from this. 2) Take support in this when bruised: “Christ’s way is first to wound, then to heal” (10). We can take comfort not only in the promise that we will not be broken in our bruising, but we can also rejoice that “according to my trials will be my graces and comforts” (10). Almost none of us would choose to walk through that door were the choice left to us but God does have good effects planned for the hard circumstances we enter upon. 3) Notice the different dispositions and intent between Christ and Satan. Satan sets upon us in our weakest to attach and destroy, whereas Christ comes to bind up the broken-hearted. The remainder of the chapter falls under the heading “Who are the bruised reeds?” It’s here that Sibbes enters into the typical Puritan style of raising perceived questions and then offering answers. It’s a straight-forward and helpful approach to thinking through tough issues. Here are three nuggets of wisdom. First, Christians are quite different and so we must be careful not to treat all bruised reeds the same. To say it differently, Sibbes insists some people are of such sensitive consciences or have a temperament where they are prone to being crushed under condemnation, whereas others are prone to excusing themselves and might be pressed with more force. “It is dangerous, I confess, in some cases, with some spirits, to press too much and too long this bruising, because they may die under the wound and burden before they be raised up again. Therefore it is good in mixed assemblies to mingle comfort that every soul may have its due portion.” (12). Second, the physical and emotional affect the spiritual, and vice versa, because we are both physical and spiritual beings.”Sometimes our grief from outward grievances may lie heavier upon the soul than grief for God’s displeasure, because, in such cases, the grief works upon the whole man, both outward and inward…especially bodily sicknesses which, by reason of the sympathy between the soul and the body, work upon the soul so far as to hinder not only the spiritual, but often the natural acts” (13). Third, we should be gracious with those in the midst of suffering by giving them some freedom in how they deal with their emotions through their words. “And therefore we ought to judge charitably of the complaints of God’s people which are wrung from them in some cases” (14). He uses Job as an example of someone who vented with God in a way that might make us feel uncomfortable, and yet the Bible says he remained blameless. Good advice indeed so we are careful not to always fact-check those who are speaking out of their pain. Since sets of three have been the pattern for this post, here are three short quotes that should always stay in our mind. 1) “There is more mercy in Christ than sin in us” (13). Rehearse this to yourself over and over. 2) “…let all know that none are fitter for comfort than those that think themselves furthest off” (14). 3) “Christ’s sheep are weak sheep, and lacking in something or other; he therefore applies himself to the necessities of every sheep” (14). Not as quotable as the other two, but if we ourselves as weak sheep in need than we might better grasp the goodness of Jesus as a gracious and sufficient Shepherd. In my recent trip to Europe (hence the grainy pic above) where I visited several beautiful, historic Catholic churches there were several questions that came to mind. As a Protestant, one of them was why the big deal about Mary? 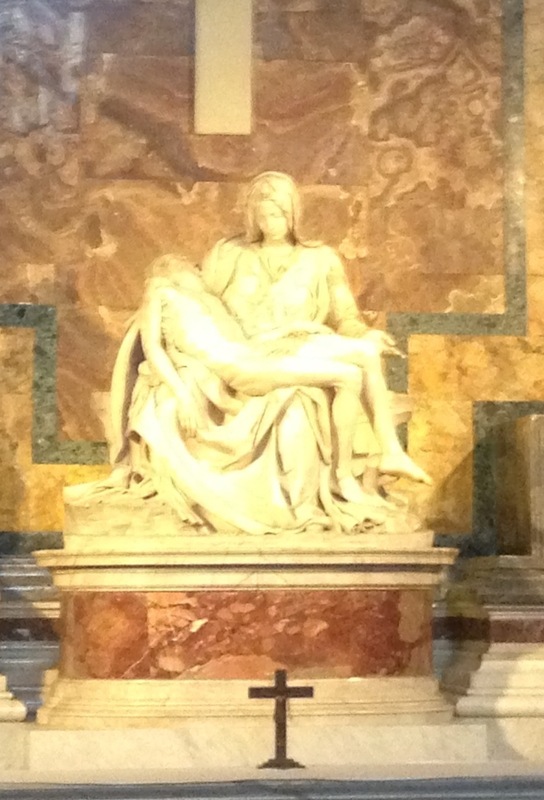 My Catholic tour guide (he was fantastic) paralleled the current Pope to Michelangelo in their preference to pray to Mary over Jesus. I’ve heard that before but it still always strikes me as curious. Why the need to make Mary more than the biblical authors do and when did it all start? Of course, to be a bit simplistic, I think part of the problem clearly lies in the fact that most people were illiterate in the church’s history, and the Bible was, unfortunately, kept away from the eyes and ears of the people. However, I still found something intriguing and wondered if any Catholics who once belonged to these ancient churches ever asked why Mary wasn’t in the story pictures. By story pictures, I’m referring to those paintings (usually on ceilings) that were meant to tell biblical stories–often the overarching biblical story–to people who couldn’t read and wouldn’t have Bibles even if they could read. What I noticed is that in these paintings of biblical stories (meaning stories actually based on the texts) is that other than the birth of Christ, Mary remains noticeably absent from the other paintings. Wouldn’t anyone in the church ever have wondered why Mary was being elevated when she’s clearly absent from the paintings retelling the biblical story? Yes, there were many paintings and statutes of Mary throughout the churches I went too, but these weren’t part of the paintings retelling the biblical story. I find this fascinating. My hope isn’t to offend Catholics but to really understand more of the history behind mariology. After returning home, I was given the chance to read a bit of early church history in preparation of teaching a session at our church. Since I don’t do well with letting things go I thought I’d do a tiny bit of digging as to when references to Mary developed as something more than just the virgin mother of Jesus. I’m just scratching the surface on this and related issues so I’d appreciate any feedback or sources. I was more interested in the historical factor of where an interest in Mary came from (and still am since this is only one factor among many). As a bible-thumping Protestant, I strongly uphold our redemption in the 2nd Adam, and since Mary is never mentioned or hinted at in regards to our salvation or paralleled as a 2nd Eve I strongly disagree with Roman Catholic theology in this regards. Not only is it a big stretch to making Mary a 2nd Eve because Jesus is a 2nd Adam, but it also seems to be a big stretch even to get from the quotes of the early church fathers on Mary being significant (because she conceived Jesus and therefore conceived life) to the later Roman Catholic teaching that she is an associate in our redemption. I’m part of a group who meet weekly with one of our pastors to discuss a number of things related to our lives and ministries. A part of that time each week goes to discussing a book we slowly read together. The book on deck is the The Bruised Reed by the Puritan Richard Sibbes (1577-1635). Despite an occasional moment of guilt for reading an abridged book and not the original, these small Puritan Paperbacks are gems. Maybe it’s a me problem, but I often read books–sometimes even marking the thing up–but I don’t digest and notate the book well enough. I thought I’d remedy this in part by employing this blog for something more noble than witty comments and enticing food pics. So, my goal as I read this book will be to summarize the main points of each chapter alongside some of the tastiest quotes I come across. From these words, Sibbes sees two things put forward: “first, the calling of Christ to his office; secondly, the manner in which he carries it out” (1). In this brief first section, Sibbes highlights the commission the Son receives from the Father. He notes the joint agreement all three persons of the Trinity enter into: “the Father gives a commission to Christ; the Spirit furnishes and sanctifies to it, and Christ himself executes the office of a Mediator” (2). Like a good Puritan, Sibbes makes it clear that where one person of the Trinity is mentioned all are present and active. In one of the subtle but significant emphases of this section, Sibbes pushes us to not only see the beauty of Jesus in taking the commission, but also to “see the sweet love of God [the Father] to us,” in commissioning his Son for the work of our salvation. In chapter 1 it’s already clear the author wrote this book to be a soothing salve to the wearied reader. “This saving object [Jesus] has a special influence of comfort to the soul, especially if we look not only on Christ, but upon the Father’s authority and love in him” (2). Right away there’s a lesson to be learned. We lift our eyes away from ourselves and up to Jesus, the Servant who takes our sin. And, as we look to Jesus we find not only relief from our guilt but we see the love of a Father, graciously bringing us back to himself. The Father doesn’t get stuck with us because we believed in his Son; the Father actually pursues us at the cost of his Son because he loves us. The application for us: “Let us therefore, embrace Christ, and in him God’s love, and build our faith safely on such a Saviour that is furnished with so high a commission” (2). As a reader, I’m already getting a gospel soaking from wave after wave of sweet truths…and I’m only on page 2. This bodes well for the rest of the book! Having seen the calling Christ takes as the Servant, the author moves to how Christ actually fulfills this commission. The rest of the chapter largely deals with what the metaphor “bruised reed’ conveys. In the previously mentioned texts from Isaiah and Matthew, Sibbes notes the condition of those the Servant deals with: weakness. This is true both prior to conversion, as the awareness of sin and insufficiency to atone for it lead to seeking out Jesus for his help, but it remains true in part after conversion. One thing I found interesting was that he suggests the degree to which people might be “bruised reeds” varies, depending on not only what God sees fit but also varying based upon “differences with regard to temperament, gifts and manner of life” (3). We’ll see this again shortly, but it’s worth noting here that those crusty ole’ Puritans might not have been as myopic as some suggest. Sibbes recognizes differences in temperament, circumstances, and providence might all affect the degree and consistency with which some might be more “bruised” than others. Anyways, back to clarifying what a bruised reed might actually mean. “The bruised reed is a man [or woman] that for the most part is in some misery,” and this misery brought about sin–whether personal or otherwise–leads to brokenness or despair. In other words, “a bruised reed and a smoking flax, make up the state of a poor distressed man” (4). Sibbes quickly moves to the good effects of this bruising, namely, that it leads us to find our supply in Christ. “This bruising makes us set a high price upon Christ. Then the gospel becomes the gospel indeed; then the fig-leaves of morality will do us no good” (4). You might want to read that quote one more time, nice and slow. He continues: “And it makes us more thankful, and, from thankfulness, more fruitful in our lives” (4). The formula seems to be: bruising –> gospel –> gratitude –> fruitfulness. Not only can bruising lead to gratitude and fruitfulness, but it’s necessary for Christians because of the way we gravitate towards pride and self-sufficiency. When things are going well, most of us coast in life. This often leads to a couple false conclusions slowly creeping into our minds. First, we start to think this world is our home and things are so good now who needs a restored kingdom. Second, we assume things are good because we’re pretty good, and because we got ourselves here. “After conversion, we need bruising so that reeds may know themselves to be reeds, and not oaks. Even reeds need bruising, by reason of the remainder of pride in our nature, and to let us see that we live by mercy” (5). This isn’t to say that bruising always comes becomes of pride, but it is to say that the cultivation of brokenness and humility comes through bruising. This then leads Sibbes to close chapter 1 with a caution not to wrongly judge or pass harsh judgment on others experiencing bruising. There might be any number of reasons why someone is in the state they are, and we honestly don’t know the causes or purposes of God. Often, foolish people assume all Christians must always be happy Christians. This explains why Sunday mornings are full of people doing their best to put on their crispest clothes and shiniest smiles. But, thankfully, there is a time for brokenness and often the bruised reeds are not those farthest from God, but those being drawn to him. “Ungodly spirits [people], ignorant of God’s ways in bringing his children to heaven, censure broken-hearted Christians as miserable persons, whereas God is going a gracious, good work with them” (6). That last sentence resonates with me and I’d love to unpack it more, but I’ll let it speak for itself and simply ask the extroverted, overly-happy majority not to assume bubbliness is next to godliness.